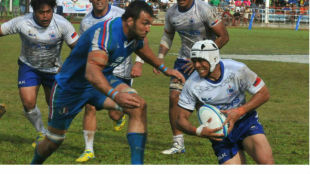 Samoa defeated Italy 15-0 in their one-off Test in Apia on Saturday, with Tusi Pisi kicking five penalty goals to secure the hosts' fifth victory from six matches against the Azzurri. The teams each had hoped to save face after disappointing performances the week before - when Tonga held Samoa to an 18-18 draw and Fiji defeated Italy 25-14 - but the Azzurri undermined themselves with repeated infringements within kicking range of Japan-based Pisi. Pisi kicked four penalties in the first half, and one in the second. Italy have now lost their last eight matches going back to last November.